What is the reason why our joy might be “full?” This reason is what John is about. What he is saying points to the cause of our joy. Ultimately, we cannot be joyful except in the light of that which alone responds to what we most want, if we could have it, to nothing less than eternal life. I believe the Book of Revelation, the Apocalypse, was written there. In it, John had little hesitation to call what are in effect bishops to order, if they needed it, which several did. Let’s hope that this charism is still to be found somewhere in the Church. That notion of completing and rejecting has become standard doctrine about evangelization. Revelation is sent to complete cultures, not to destroy them. But men are too attached to their vices and too satisfied with their goods to notice what they do not yet have, what is being addressed to them. They need to rid themselves of their evils and complete their goods. The chief reason that they are not prepared for what is revealed lies, I think, in their lack of a philosophy, an order of reason, of what is, that would hint to them what is wrong and what they are missing. That truth you find unchangeable throughout the ages, and therefore it is, that on the first appearance of the Church, the challenge is already declared – and that is what is meant by Patmos. Revelation provokes, challenges, upsets. Its basics do not change. It is from eternity. It teaches us the completion of what we are and therefore of what we want. It gives us more than we are while we remain what we are, finite human beings, passing through our time, in whatever time we are given. We talk of “realism,” political and otherwise. Yet, no realism is quite like that found in the first epistle of John. Perhaps more than any other New Testament writer, even Paul, John draws fire for his bluntness, his calling things as they are. The Word was made flesh. He did dwell amongst. Through Him alone we are given grace upon grace. No one knows the Father but the Son and those to whom He reveals it. We live in an era in which we want to hear of “new things” (rerum novarum). We cannot quite grasp that Christianity was not intended to evolve into something else other than what John saw, heard, and touched. The Catholic Church does not exist to come up with something “new” that no one ever thought up before. Of course, what it teaches and holds is precisely what no one ever heard before. But once we have heard it, we forget that its newness is rooted in the very being of God, ever ancient, ever new. Catholic theology does not exist to spin out things no one ever heard before. Its theologians and apologists, when they are orthodox, tell us, more deeply, what was said and handed down to us “from the beginning.” The last thing they should claim or imply is that this teaching about the reality of the Incarnation, Redemption, and Resurrection is something of their own making, genius, or concoction. That theologian is a dangerous man who lacks the humility to see that he is, at best, passing on what he had seen and heard from others, ultimately from those who were there at the Nativity, at Cana, at Golgotha, at the empty tomb – or on Patmos. 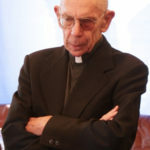 James V. Schall, S.J. 1928-2019, who served as a professor at Georgetown University for thirty-five years, was one of the most prolific Catholic writers in America. Among his many books are The Mind That Is Catholic, The Modern Age, Political Philosophy and Revelation: A Catholic Reading, Reasonable Pleasures, Docilitas: On Teaching and Being Taught, Catholicism and Intelligence, and, most recently, On Islam: A Chronological Record, 2002-2018.